Comic Sans has been getting a bad rap in recent years. Everybody’s poo pooing it for some reason. I for one, actually enjoyed it when it was the standard font for the Notes app in iOS 6. Even Helvetica is being driven out of the cool club these days. Well, I believe that there’s a time and place for every font. 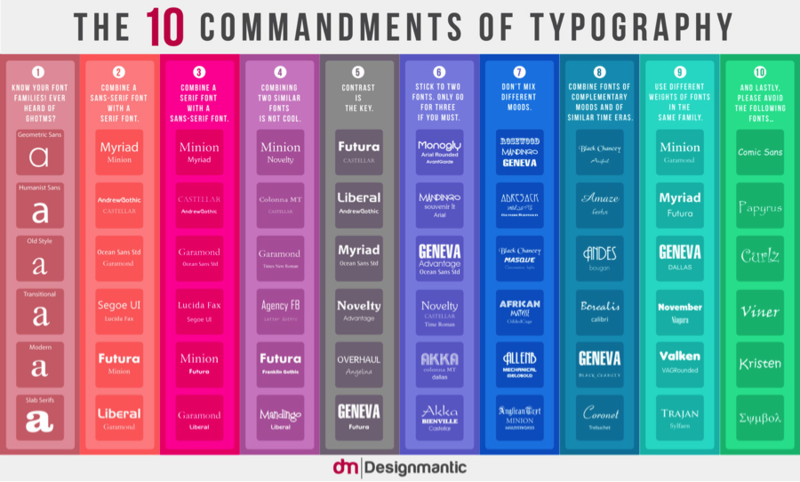 Recently, fellow BU MSIT alumna Melissa Milloway (melslearninglab.com and @MelMilloway) posted a link to an infographic on The 10 Commandments of Typography. While I agreed with a lot of the “commandments” listed, it brought me back to thinking that there could be a time and a place and a purpose for every font. I would like to stress that again: “…there could be a time and a place and a purpose for every font.” That doesn’t mean it’s okay for my buddy Phil to use Minstrel, or whatever horrible script font he uses, for his email signature (sorry Phil, I still love ya). My point is, it’s really okay to use bad fonts like Comic Sans in certain situations. For example, I made a spoof image mashing up Game of Thrones and Frozen where the font choices were very deliberate (as they should be). The Comic Sans font is used in Olaf’s dialogue bubble and is appropriate for the playful, childish character he is. While Lucida Blackletter, used in Ned Stark’s dialogue bubble is a very serious, medieval-type font. They juxtapose each other in order to pull off the comedic nature of the image. So, depending on the application and your audience, it can be okay to use some not-so trendy fonts, but don’t make this your excuse. One of the great things about typefaces that become villified due to inappropriate application or overuse is they gain a platform from which they can be used to portray irony, sarcasm, satire, dry wittedness, and so on. Tomorrow, my fellow teammates and I will be presenting at Bloomsburg University’s MSIT Corporate Advisory Council on scenario-based learning. We will talk about our previous lecture model, the transition to SBL, and the different types of scenarios that we have implemented thus far. It’s always a pleasure to come back to our alma mater and it’s especially exciting to come back to present to current students, other alumni, department instructors, and other professionals in the field. There’s always something exciting happening at #BUCAC . I recently contributed another Toolbox Tip article for ASTD.org’s Learning Technologies Blog on editing images within Articulate Storyline. Read it here. I recently contributed an article for ASTD.org’s Learning Technologies Blog on using stock images in eLearning. Read it here.